Rachel Fordham’s debut novel The Hope of Azure Springs is book one of a three book deal with Revell. 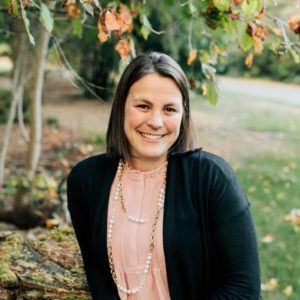 In addition to writing and researching Rachel also teaches writing courses and loves engaging with other bookish. Her number one passion is her family, in fact their antics are often the topics of her social media posts. They reside together on beautiful island in Washington state. Welcome to the blog, Rachel. I’m so honored to have you here today. Congratulations on your upcoming release, The Hope of Azure Springs. Everything about this story draws me in – the title, the cover, the plot. I’m so excited to read it! What do you love most about your hero and heroine in this story? I love that Em is not your typical heroine. She’s got a lot against her. Physically she’s not what you would expect from a heroine. She’s not gorgeous. Some describe her as waifish or plain. She’s very down on her luck in the beginning. There is no wealth or fame to lean back on. She’s had it hard. Really hard. But she’s a survivor and she fights on. I believe readers will feel drawn to her plight and find themselves rooting for her and drawn to her tenacious spirit. Caleb is a more traditional lead. He is handsome and has a respectable career. At first it seems like he has everything together but he has his own burdens he’s carrying. His softer side doesn’t take too long to come out and I love a man that has at least a little bit of an emotional side. I think my favorite thing about my lead characters is the combination of them together. They are not two people you would naturally pair up. I don’t want to spoil it but I think you’ll enjoy watching them interact as much as I enjoyed writing them. For this particular story the easiest part was when I initially started writing it. It just kind of poured out of me. I’d sit down and then the next thing I knew I’d have two thousand more words on the page. The hardest part was when my son became very ill while writing this manuscript. It was so serious I could not write for five months. It was all too trivial in comparison to what our family was going through. When I did return to the manuscript it was no longer just Em and Caleb’s story. I think my own struggle and pain were written in. Not so much in the actual character arcs but into the themes and heart of the story. I’m not sure I’m answering your question very well. Creating and making up stories is fun and usually easy. Sometimes it’s hard getting what is in my head to translate itself onto the page. But even that is a fun challenge. The hardest thing is balancing it all with life. I am grateful I can write any time of the day or night. I try to not let my writing time cut into my family time to often and I’ve had to accept that there are seasons when writing just can’t happen. I just read Joanne Bischof’s series Cadence of Grace. My take away from these lovely books is the sweet reminder that we all make mistakes. Joanne did an excellent job of showing redemption but also the pain and consequences that can result from poor decisions. Great books. What do you love most about your home state of Washington? I wish I could say that rain but we recently had a leak in our house and since then I’ve been nervous whenever I hear the patter of raindrops! I love the trees and mountains and beaches. It’s really beautiful here (even when it rains). Can you tell us some of the authors who inspire you? I’d love to but I have to put a disclaimer here. There is not enough room for me to list all of the authors I adore. I grew up reading L.M. Montgomery, Charlotte Bronte, Jane Austen and Jean Webster (and many others). I always loved historical reads and strong character development. I often go back and revisit the classics. It’s like spending time with old friends. In recent years I’ve discovered so many other authors that I can’t get enough of. Laura Frantz, Tamara Alexander, and Julianne Donaldson are a few. I am amazed by how many skilled and talented authors are out there. I just sent in a first draft of a manuscript to my editor and am anxiously awaiting her feedback. I’m excited about this project. The story starts off in the dead letter office in Washington DC but it ends up back in Azure Springs Iowa! Yay! Can’t wait to read this series, Rachel. I’m so happy you stopped by today. Blessings to you and your family! 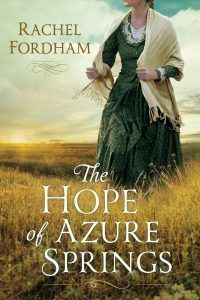 Rachel has graciously offered to give away one ebook copy of The Hope of Azure Springs to one lucky winner. Enter below and it could be YOU! Thanks for entering! Contest is open to US residents only. Contest ends July 3, 2018. The winner will be notified by email. Happy Reading, everybody! I just finished Once Upon A Prince by Rachel Hauck. This was a fun story. And there are a few surprises. The Forgotton Girl by Heather Chapman. I really enjoyed it. Accidental Guardian by Mary Connealy. I am reading “Never Borrow a Baronet” by Regina Scott (on the Kindle) and “Falling to Pieces” by Vannetta Chapman. Those are both new to me, Wendy. Thanks for sharing! Actually I just finished a novella by Karen Witemeyer, one of the Archer brothers series, A Cowboy Unmatched. Thank you for the interview and opportunity to participate. Ohhh, I LOVE the Archer brothers. 🙂 Karen Witemeyer’s stories are always so much fun. Thanks for visiting, Cathy! The last book I read was a Prequel novella by Sally Britton, Martha’s Patience. I really enjoyed it. Thanks for the giveaway opportunity and good luck everyone. I haven’t heard of that one before, Debbie. I’m glad you mentioned it. 🙂 Good luck in the giveaway! Hi Savanna! I just finished The Hidden Side by Heidi Chiavaroli. This book sounds intriguing. Thanks! I finished “From Hollywood To Holy Vows” The biography of Sister Dolores. Hi Joan! That definitely sounds like an interesting read. Thanks for sharing! Ohhh, that one looks so good. I LOVE Karen Witemeyer’s books. Thanks for stopping by, Megan. Doesn’t it look amazing?! Hope you get to read it soon, Colletta. Thanks for joining us. I’ve heard a lot of great things about this book. It’s always fun finding new authors. I recently finished A Defense of Honor by Kristi Ann Hunter. I love her writing. She has a great sense of humor. I just finished Dead Drift by Dani Pettrey and loved it! I’ve heard about that one. I need to check it out, Shamekka! I just finished Edenbrooke by Julianne Donaldson! I need to check that one out, Joan. Thanks for sharing! I’ve been hearing about her books. I need to grab a copy soon! 😉 Thanks for visiting, Brenda. I last read Patricia Beal’s debut A Season To Dance. It was a really good story of how Jesus can bring peace and joy and fulfillment to a life that is miserable and always looking for something to satisfy. I enjoyed it! That sounds like a lovely read, Hannah. Thanks for sharing! I just finished Terri Blackstock’s Moonlighters series. The Love Letter by Rachel Hauck. Thanks for the opportunity to win! I’m reading that now and it’s so good! Good luck in the giveaway, Nicole! I love hearing what everyone is reading. This one is new to me, Debbie. Thanks for sharing!